Little or no background in economics or higher level mathematics? Not a problem. 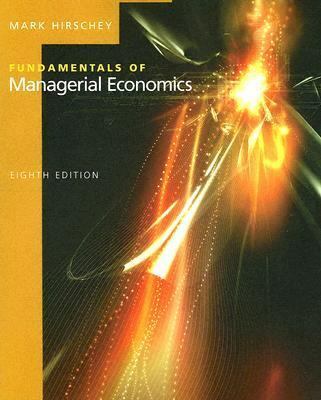 FUNDAMENTALS OF MANAGERIAL ECONOMICS focuses on the economics, not the mathematics, of the managerial decision process. You'll learn how managers use economics to make decisions and stay ahead of change. And in this version, you'll learn it fast through captivating examples and uncomplicated math. Plus it comes with Economics Applications Access! This powerful program walks you step-by-step through the decision-making process using economics.Hirschey, Mark is the author of 'Fundamentals of Managerial Economics', published 2005 under ISBN 9780324288896 and ISBN 0324288891.